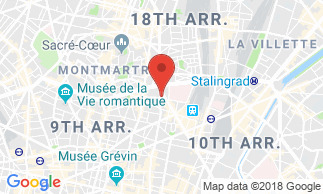 The Altona Hotel is ideally located near the Gare du Nord and the Gare de l'Est railway stations, a few minutes from the Place de la Republique. The Sacre-Coeur Basilica and Montmartre are also a short walk from the hotel. In a beautiful building of the early 20th century, the Altona Hotel offers you a personal welcome. The Hotel has single, twin or double, triple and quadruple rooms to meet the needs of families, groups and business travelers. It also offers a 24-hour front desk and free Wi-Fi access. The 54 rooms are soundproofed and feature simple and sober design. They are equipped with a private bathroom with shower or bathtub and hairdryer, satellite TV and telephone. All rooms are accessible by lift. Free Wi-Fi connection is available throughout the hotel. The quadruple room has 4 single beds or a double bed and 2 single beds. The exceptional location is a major asset of the Hotel Altona. Within just a few minutes you can reach the 'Gare du Nord' and the 'Gare de l'Est' railway stations where you can take the Eurostar or the Thalys trains. The Sacre-Coeur Basilica in the Montmartre district and the Moulin Rouge are also within walking distance. The nearby Barbes-Rochechouart metro station serving the lines 2 and 4, will allow you easy access to the main sites and monuments of Paris. A large breakfast room of 55 seats welcomes you for breakfast each morning from 6:30 am - 9:30 am. Breakfast is not included in the room rate: 6 EUR per person.